This document is a technical summary of the Federal Highway Administration report Safety Evaluation of Corner Clearance at Signalized Intersections (FHWA-HRT-17-084). The Federal Highway Administration (FHWA) established the Development of Crash Modification Factors (DCMF) program in 2012 to address highway safety research needs for evaluating new and innovative safety strategies (improvements) by developing reliable quantitative estimates of their effectiveness in reducing crashes. The ultimate goal of the DCMF program is to save lives by identifying new safety strategies that effectively reduce crashes and promote those strategies for nationwide implementation by providing measures of their safety effectiveness and benefit–cost (B/C) ratios through research. State transportation departments and other transportation agencies need to have objective measures for safety effectiveness and B/C ratios before investing in broad applications of new strategies for safety improvements. Forty State transportation departments provided technical feedback on safety improvements to the DCMF program and implemented new safety improvements to facilitate evaluations. These States are members of the Evaluation of Low-Cost Safety Improvements Pooled Fund Study, which functions under the DCMF program. This study evaluated corner clearance at signalized intersections. The intent of this strategy is to reduce the frequency of angle crashes at intersections by increasing the distance between driveways and intersections. Several research studies explored management techniques and the effects of access points on safety at a corridor level. However, little quantitative information is available for the safety effects of driveways located near the corners of a signalized intersection and the effects of access management strategies on intersection crashes. This study investigates the safety effects of corner clearance on the mainline at four-leg, signalized intersections. Corner clearance is defined as the distance between an intersection and the nearest driveway or access point along the approach. Adequate corner clearance is an important factor in the safety and operations at intersections. The American Association of State Highway and Transportation Officials (AASHTO) publication A Policy on Geometric Design of Highways and Streets (also known as “The Green Book”) notes that driveways should not be located within the functional area of an at-grade intersection or in the influence area of an adjacent driveway. (1) However, the presence of conflicting driveways within the functional area is often unavoidable, especially in urban environments. 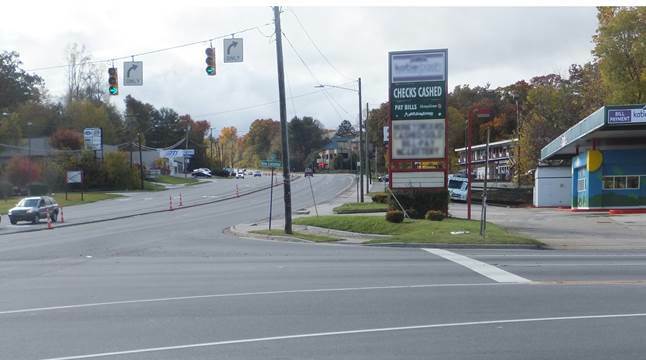 While inadequate corner clearance is a concern for all types of intersections, signalized intersections develop recurring queues within the functional area of the intersection that can lead to conflicts with vehicles turning in and out of driveways. Approaches to signalized intersections also have more lanes on average than other types of at-grade intersections, which can cause difficulties for drivers leaving driveways to weave and maneuver into their desired lanes. Figure 1 shows a photo of a signalized intersection with limited corner clearance. Figure 2 shows a general layout of the study site. Figure 1. Photo. Signalized intersection with limited corner clearance. Figure 2. Schematic. General layout of study site. The research team conducted a literature review that concentrated on the safety effects of corner clearance distance as well as access spacing and various property access management strategies. Most evaluations to date have focused on corridor safety effects rather than intersection safety. Kwigizile et al. examined changes in the number of crashes at urban signalized intersections as a result of corner clearance and other variables. (2) A zero-inflated negative binomial model was selected from four model forms as the best model for determining the safety effects of the treatment. The authors modeled corner clearance as the number of corner clearances (i.e., number of access points) and the average corner clearance in feet, with a maximum of 250 ft. The results indicated that increased corner clearance and fewer access points yielded fewer crashes. Commercial driveways with limited corner clearance led to higher crash rates than residential accesses. Signals with higher minor road volumes had a higher number of crashes. Crashes generally increased with the addition of left-turn lanes and through lanes, with through lanes leading to a greater increase. Total: all crashes within 250 ft of intersection (all types and severity levels combined). Fatal and Injury: all injury crashes within 250 ft of intersection (fatal injury, incapacitating injury, non-incapacitating injury, and possible injury). Rear-end: all crashes coded as “rear-end” within 250 ft of intersection. Sideswipe: all crashes coded as “sideswipe” within 250 ft of intersection. Right-angle: all crashes coded as “right-angle” within 250 ft of intersection. Turning: all crashes coded as “right-turn” or “left-turn” within 250 ft of intersection. Nighttime crashes: all crashes with light condition coded as “night,” “dawn,” or “dusk” within 250 ft of intersection. A further objective of the project was to conduct a disaggregate analysis to investigate whether the safety effects vary by factors such as the level of traffic on the mainline and cross streets, number of lanes, posted speed limit, driveway density, and the presence of exclusive right- and left-turn lanes. The research team used a cross-sectional study design for the evaluation. At the most basic level, the safety effect is estimated by taking the ratio of the average crash frequency for two groups, one with the treatment and the other without the treatment. The two groups of sites should be similar in all regards except for the presence of the treatment. This is difficult to accomplish in practice. The research team adopted the propensity score matching technique to match sites with and without the treatment while using multiple variable regression modeling to control for other characteristics that vary among sites. The research team employed multiple variable regression to develop the statistical relationships between the dependent variables and a set of predictor variables. In this case, crash frequency was the dependent variable, and the team considered several predictor variables, including number of corners with limited clearances, traffic volumes, and other intersection and roadway characteristics. The research team considered regression coefficients during the modeling process for each predictor variable. The coefficients represent the expected change in crash frequency due to a unit change in the predictor variable with all else being equal. The research team applied generalized linear modeling techniques to develop the crash prediction models and specified a log-linear relationship using a negative binomial error structure. The negative binomial error structure has advantages over the Poisson distribution in that it allows for overdispersion of the variance that is often present in crash data. The results are presented in two parts. The first part contains aggregate results, and the second part is based on a disaggregate analysis that sought to identify those conditions under which the strategy is most effective. The study presented aggregate results separately for the number of approach corners (i.e., one or two) and number of receiving corners (i.e., one or two) with driveways within 50 ft of the intersection compared to no driveways within 50 ft of the intersection on the approach or receiving corners, respectively. Table 1 and table 2 provide the crash modification factor (CMF) estimates for all crash types. Table 1. Estimated CMFs for limited approach corner clearance. **Indicates statistically significant results at the 95-percent confidence level. Table 2. Estimated CMFs for limited receiving corner clearance. *Indicates statistically significant results at the 90-percent confidence level. The CMFs associated with the receiving corners were consistent with expectation, indicating crash increases for limited corner clearance (i.e., driveways within 50 ft of one or both receiving corners) compared to no driveways within 50 ft of both receiving corners. However, the results associated with the approach corners appear counterintuitive, indicating crash decreases for limited corner clearance (i.e., driveways within 50 ft of one or both approach corners) compared to no driveways within 50 ft of both approach corners. It is important to note that the CMFs from table 1 and table 2 are independent, and the results do not suggest crash migration from the receiving corners to the approach corners. Readers can refer to the full project report for a more detailed discussion of the results and a few possible explanations for the results that are counter to the general hypothesis of the study. The objective of the disaggregate analysis was to identify those conditions under which the strategy is most effective. The research team considered several variables in the disaggregate analysis, including major and minor road traffic volumes, number of lanes on the major and minor road, posted speed limit, driveway density, and presence of left- and right-turn lanes. The multiple variable regression models included interaction terms to investigate the potential differential effects of corner clearance with respect to the interacted variable. For example, the interaction term for major road traffic volume and number of major road approaches with driveways within 50 ft is the product of the two variables. A statistically significant interaction term would indicate an apparent differential effect of corner clearance across different traffic volumes or the other variables of interest. The results indicated that none of the interaction terms were statistically significant at even the 80-percent confidence level. While these results indicate no differential effect of corner clearance, it is possible that the sample size is too small and/or there was little variation in the variables of interest to detect differential effects at the desired level of confidence. For the economic analysis, the research team assumed increasing corner clearance involved the removal of driveways with corner clearance of 50 ft or less by installing concrete curbing and sidewalk in place of the mainline access for a commercial property. The intent was to shift traffic to an existing access on the cross street or further downstream (corner clearance more than 50 ft) on the mainline. The cost did not include the construction of a new access point, which, if necessary, would drastically increase the estimated cost of the treatment. The research team assumed another mainline or cross street access could continue to provide access to the property. Based on cost information for concrete sidewalks with curb and gutter from the National Cooperative Highway Research Program (NCHRP) Report 500 Volume 10: A Guide for Reducing Collisions Involving Pedestrians, curbing costs an average of $15 per linear ft and walkways cost $11 per square ft.(3) Assuming a sidewalk width of 6 ft, the average installation cost is $81 per linear ft of curb and sidewalk. Although most access points are narrower, the analysis used a conservative assumption of 100 ft of curb and sidewalk to connect walkways on either side of an existing driveway. Given these assumptions, the construction cost for removing access points is approximately $8,100 per access point per corner. The project team assumed the construction cost per corner was the same regardless of the number of corners treated. The FHWA Office of Safety Research and Development suggested using the Office of Management and Budget Circular A-4 as a resource for the real discount rate of sevenpercent to calculate the present value benefits and costs of the treatment during the service life. (4) With this information, the analysis used a Capital Recovery Factor of 7.02. To determine the safety benefits of increasing corner clearance, the project team analyzed the safety effects of removing access points with less than 50 ft corner clearance on one or both mainline receiving corners of an average signalized intersection that had two receiving corners with limited corner clearance. The data summary in the full report shows an average crash frequency of 4.36 crashes per site per year at four-legged, signalized intersections with no limited corner clearance on receiving corners. The research team multiplied the average crash frequency by the total crash CMFs of 1.33 and 1.76 to estimate the crash frequency at sites with limited clearance on one (5.80 crashes per site per year) and two receiving corners (7.67 crashes per site per year). The research team used the differences in crash frequency between sites with two and one limited clearance corners (1.87 crashes per site per year) and two and zero limited clearance corners (3.31 crashes per site per year) as the average reduction of total crashes in each scenario. The research team calculated the annual economic benefits by multiplying the total crash reduction per site per year by the average cost of a total crash and then annualizing the result during the service life. USDOT recommended conducting a sensitivity analysis by assuming values of a statistical life of 0.55 and 1.38 times the 2016 value as lower and upper bounds. (6) Researchers can apply these factors directly to the estimated B/C ratios. Table 3 presents the results. These results suggested that removing access on mainline receiving corners to improve corner clearance, with reasonable assumptions on cost, service life, and the value of a statistical life, can be cost effective for reducing crashes at signalized intersections. Practitioners should conduct their own economic analysis for the site at which they are considering access point relocation or removal, with crash and project cost information specific to that site. This analysis demonstrates the process that practitioners could use for economic analysis. This study’s objective was to undertake a rigorous cross-sectional evaluation of the safety effects, as measured by crash frequency, of mainline corner clearance at four-legged, signalized intersections. The study compared signalized intersections with various corner clearance using data from California and Charlotte, North Carolina, to examine the effects on specific crash types: total, fatal and injury, rear-end, sideswipe, right-angle, turning, and nighttime crashes. The study did not investigate the effects of corner clearance on the cross-street approaches or intersections with three legs or more than four legs. The estimated CMFs indicated that more limited clearance on receiving corners (i.e., driveway(s) within 50 ft of the signalized intersection) was associated with increases for all crash types, based on the data included in this analysis. These increases were statistically significant at the 90-percent level or greater for total, fatal and injury, rear-end, sideswipe, right-angle, and nighttime crashes. The total crash CMFs are 1.33 and 1.76 (SE = 0.11 and 0.30) for one and two receiving corners, respectively. Similarly, the CMFs for fatal and injury crashes are 1.29 and 1.68 (SE = 0.11 and 0.29). The CMFs for rear-end crashes are 1.36 and 1.86 (SE = 0.14 and 0.38). The CMFs for sideswipe crashes are 1.31 and 1.71 (SE = 0.14 and 0.38). The CMFs for right-angle crashes are 1.42 and 2.02 (SE = 0.20 and 0.56). The CMFs for turning crashes are 1.22 and 1.49 (SE = 0.15 and 0.36). The CMFs for nighttime crashes are 1.29 and 1.67 (SE = 0.13 and 0.35). Only the results for turning crashes were not statistically significant at the 90-percent level. Table 3. B/C ratios for removing receiving corner access points from a site with limited clearance on two receiving corners. For limited corner clearance on the approach corners, the results indicated statistically significant reductions in total, fatal and injury, and rear-end crashes. The results also indicated reductions in sideswipe and nighttime crashes, and increases in right-angle and turning crashes, but none of these results were statistically significant at the 90-percent level. In other words, each additional mainline approach corner with at least one driveway within 50 ft of the corner is statistically associated with decreases in these crash types. Although unintuitive, this may be the result of localized congestion on the approach corners of an intersection. The total crash CMFs for one and two approach corners are 0.82 and 0.67 (SE = 0.08 and 0.13), respectively. Similarly, the CMFs for fatal and injury are 0.79 and 0.62 (SE = 0.08 and 0.13). The CMFs for rear-end crashes are 0.79 and 0.63 (SE = 0.09 and 0.15). The estimated CMFs for sideswipe, right angle, turning, and nighttime crashes indicate a mix of no changes, a slight increase, or a slight decrease in crashes associated with limited clearance on the approach corners and none of these results are statistically significant. The disaggregate analysis did not reveal any differential effect of corner clearance at the 80-percent confidence level. The economic analysis, based on total crashes and assuming a 10-year service life, resulted in an average B/C ratio of at least 294 to 1 for most intersections when removing or relocating access at one or more mainline receiving corners with limited corner clearance. With the USDOT recommended sensitivity analysis, these values could range from 162 to 1 up to 405 to 1. While this research suggested the presence of driveways on mainline approach corners does not increase total, fatal and injury, rear-end, and sideswipe crashes, more research is required before agencies may consider this as a strategy for reducing crashes. These results suggest that removing or relocating driveways on the mainline receiving corners can be highly cost effective in reducing crashes at four-legged, signalized intersections. American Association of State Highway and Transportation Officials. (2011). A Policy on Geometric Design of Highways and Streets, 6th ed., AASHTO, Washington, DC. Kwigizile, V., Mulokozi, E., Xu, X., Teng, H., and Ma, C. (2014). “Investigation of the Impact of Corner Clearance on Urban Intersection Crash Occurrence,” Journal of Transportation and Statistics, 10 (1), Bureau of Transportation Statistics, U.S. Department of Transportation, Washington, DC. Zegeer, C., Stutts, J., Huang, H., Cynecki, M., Van Houten, R., Alberson, B., Pfefer, R., Neuman, T., Slack, K., and Hardy, K. (2004). Guidance for the Implementation of AASHTO Strategic Highway Safety Plan, Volume 10: A Guide for Reducing Collisions Involving Pedestrians, National Cooperative Highway Research Program Report 500, Transportation Research Board of the National Academies, Washington, DC. Office of Management and Budget. (2003). Circular A-4: Regulatory Analysis, Office of Management and Budget, Washington, DC. Council, F., Zaloshnja, E., Miller, T., and Persaud, B. (2005). Crash Cost Estimates by Maximum Police-Reported Injury Severity within Selected Crash Geometries, FHWA-HRT05-051, Federal Highway Administration, Washington, DC. U.S. Department of Transportation. (2016). Guidance on Treatment of the Economic Value of a Statistical Life (VSL) in U.S. Department of Transportation Analyses—2016 Adjustment, Memorandum, obtained from: https://cms.dot.gov/sites/dot.gov/files/docs/2016 Revised Value of a Statistical Life Guidance.pdf. Researchers—Thanh Le; Frank Gross; Tim Harmon; and Kimberly Eccles. Key Words—Corner clearance, Signal, Intersection, Low-cost, Safety improvements, Safety evaluations, Empirical Bayesian.